Yes, the news finally arrived yesterday that Virat Kohli, the Indian cricket team captain got hitched with her long-term girlfriend and one of the most lovely and talented actress of Bollywood, Anushka Sharma. Speculations were going long in the industry that probably they are getting married in December and news came into limelight when Virat took a leave from the India Vs Srilanka home tournament. The wedding ceremony was attended only by close friends and family at countryside resort named Borgo Finocchieto in Milan, Italy. The wedding vows were taken with a traditional Hindu ceremony. The newly wedded couple broke the news of their wedding on Monday evening by sharing the pictures and video clips of all ceremonies of their wedding. Both the bride and groom were looking gorgeous in their wedding attire designed by Sabyasachi Mukherjee. 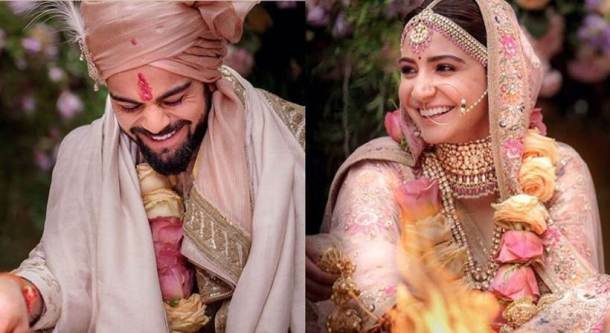 Fans are really happy that “Virushka” wedding news and wished them over twitter with congratulatory messages. On December 21, there will be a reception in Delhi for all relatives and on December 26 a reception will be given for the industry friends and the members of cricket world.